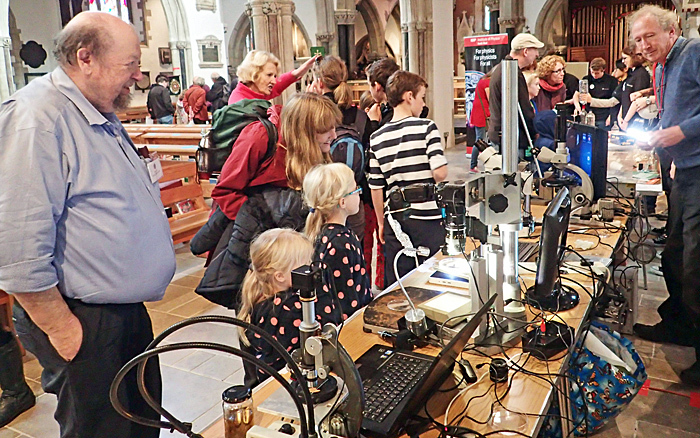 We were invited to set up a microscopical display at the Sidmouth Science Festival this year, as part of our outreach programme. The description of the Festival at http://www.visitsidmouth.co.uk/sidmouth-events/sidmouth-science-festival shows the range of events which took place during a week of activities. 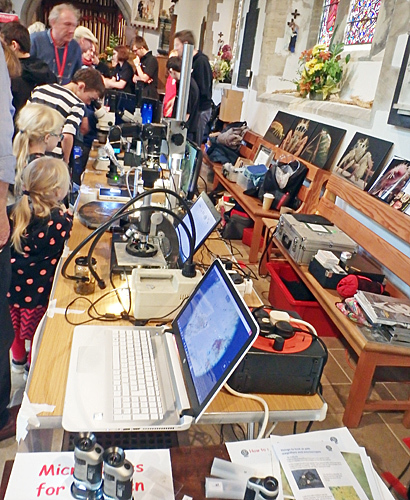 We were there on the final day, Super Science Saturday, when a large number of organisations set up displays in a variety of venues including local churches. 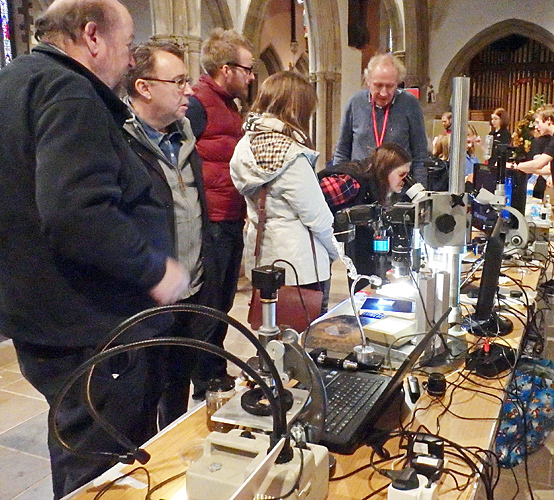 We were in the parish church along with displays with a physics theme by the Institute of Physics, the Met Office and a couple of other displays showing simple experiments. 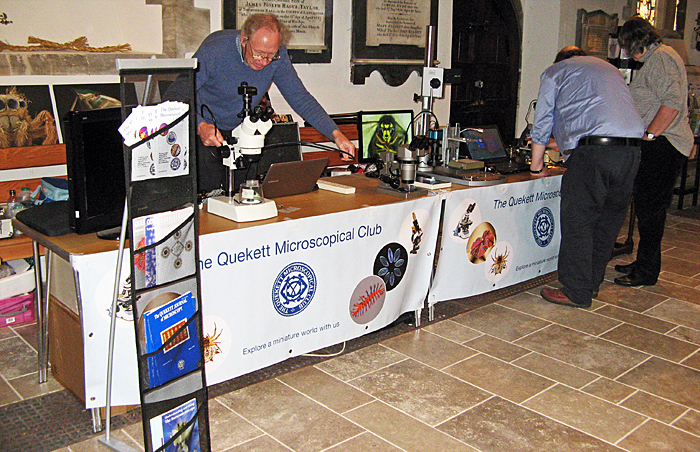 A couple of tables were set up with a variety of microscopes with Club members bringing a fine collection of microscopes and cameras. 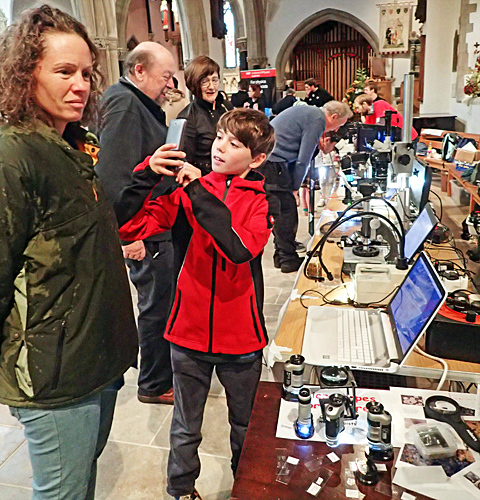 David Spears, Madelaine Spears and Grenham Ireland showed a range of specimens from a really scary insect head on a stereomicroscope to rotifers from a bird bath. 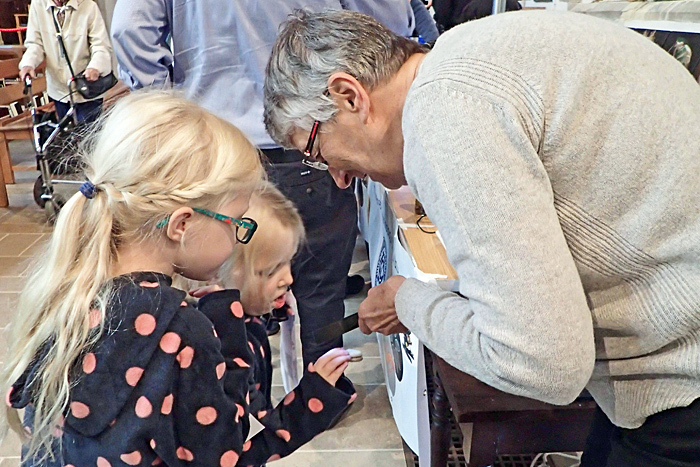 There was also a display of the NHM small microscopes and magnifiers so children could explore specimens themselves. The Festival is clearly a very popular local event as there was quite a crush of people all day long from the smallest children with parents to teenagers and older people. Many of the latter were very interested in the photographic systems that David had brought. A number of people were intrigued by our name – Quekett, and seemed very interested in our history. There was a lot of interest and we enjoyed the day. The local organisers were very hospitable providing coffee and sandwiches to keep us going through the day. They seemed pleased with the interest shown in our display – so much so that they have invited us back next year! Report by Pam H., photographs by Madelaine Spears and Pam H.